If you are looking for information on the Guidant Financial, self directed IRA, self directed 401k rollover plans, business capitalization, self guided IRA, franchise capitalization program, entrepreneur capitalization program, franchise funding, business purchase, buy real estate using retirement funds, IRA rollover, 401k, 403b, no taxes or penalties, then you have come to the right place. Guidant Financial Group™, Inc. is a non-traditional financial services company focused on delivering unique solutions to the self-directed investing market. We have quickly become the nation's leading retirement account facilitator by offering products and services designed to enhance investor profitability and overall experience, giving investors complete control and flexibility in the retirement investments they choose to make. Guidant provides customized solutions for individuals based on their specific investing goals and needs. 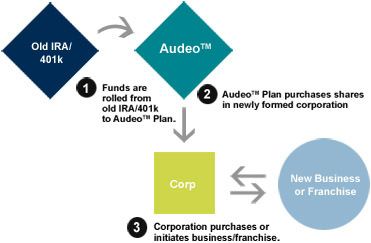 Using your existing IRA or 401(k) funds, Guidant's Audeo™ program enables the purchase of a new or existing business or franchise without taking a distribution or applying for a loan. Guidant's Audeo™ program is structured in a way that permits an individual's retirement plan to actively invest in a business, franchise or pursue business activity (i.e. real estate development or flipping). Audeo™ provides some unique advantages over obtaining debt financing from an SBA or home equity loan. Because your retirement funds can be structured as an investment into the business, and not a loan, there are no corresponding debts that increase your business overhead. Audeo™ permits entrepreneurs to transform their business success into a powerful tool for tax deferred retirement growth. Audeo™ has been developed over the years by our team of attorneys who specialize in tax and ERISA law, and professionals in the field of business and finance. Using some of the laws that enable the Employee Stock Ownership Plans of industry giants like Johnson & Johnson and Anheuser Busch, the Audeo™ program was built to enable small, private companies to utilize retirement funds as a source of business capital. Guidant's Entrepreneur Pension, Audeo™, is the premier funding solution for new business owners. Not every person has the courage and skill-set to take the entrepreneurial leap. Those that make it, however, and stick with it, will find that they will not ever want to go back to being an employee.